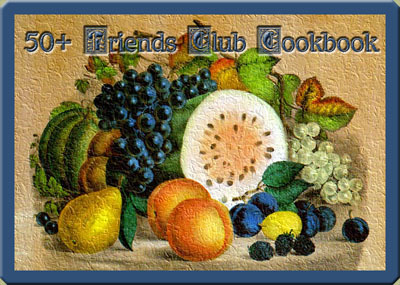 We are sorry to announce that the 50+ Friends Club Cookbook will no longer be updated. The exception to this are the chapters listing Pepper as the editor. However, rest assured, we will keep the current cookbook online indefinitely. NOTE: PLEASE, read the following before sending email regarding the cookbook. The cookbook is NOT available for sale either in printed form or on CD. The recipes have been contributed by various individuals and are not the exclusive property of the 50+ Friends Club. However, please feel free to print out any recipes you care to. We do NOT have any email list whatsoever. Any emails you've seen have been sent from one individual to another. Evolution of a Cookbook -- We, too, had a beginning. If you would like to submit a recipe to one of Peppers chapters, just click on her name and fill out the form. Legend for icons appearing next to recipe names. This table will appear at the bottom of each Chapter Index.